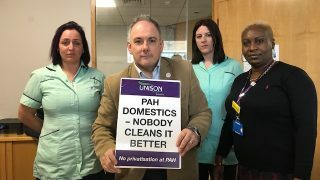 Bosses at the Princess Alexandra Hospital NHS Trust in Harlow have made the ‘breathtaking’ decision to put their cleaning services out to tender, UNISON says today. The Trust has already begun market testing its domestic and estates services. It is now inviting private companies to bid on running the services and is expected to appoint a private contractor by July. UNISON warns that outsourcing services will drive down pay and conditions as staff will no longer be on nationally agreed NHS contracts while new staff will likely be employed on worse conditions, creating a two-tier workforce. There is evidence that outsourcing leads to worse services and there has been a long history of contracts failing when the private sector gets involved, says UNISON. The most high-profile failure of an NHS contractor was Carillion’s collapse in January 2018, while fellow private contractor Interserve is currently trying to agree a rescue deal with banks and shareholders. 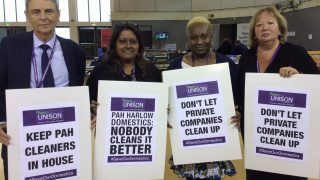 UNISON Eastern regional organiser Caroline Hennessy said: “It’s breathtaking that PAH is threatening to outsource its hardworking cleaners while contracting giant Interserve is scrambling around for a rescue deal and so soon after the first anniversary of Carillion’s collapse. “Private contractors have shown they can’t be relied on to run our public services, but bosses at PAH are either not paying attention or they think it’s OK to gamble with patients’ safety to save a few quid. “Patients shouldn’t be exposed to unsafe hygiene levels because a private contractor has cut services to boost their profits. “And staff shouldn’t be forced onto worse pay and conditions for the sake of an ideologically driven attempt to privatise our vital NHS services. 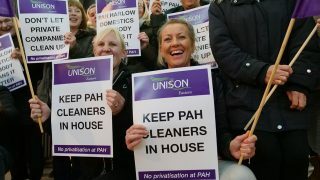 Please sign the petition to keep PAH domestics in house.